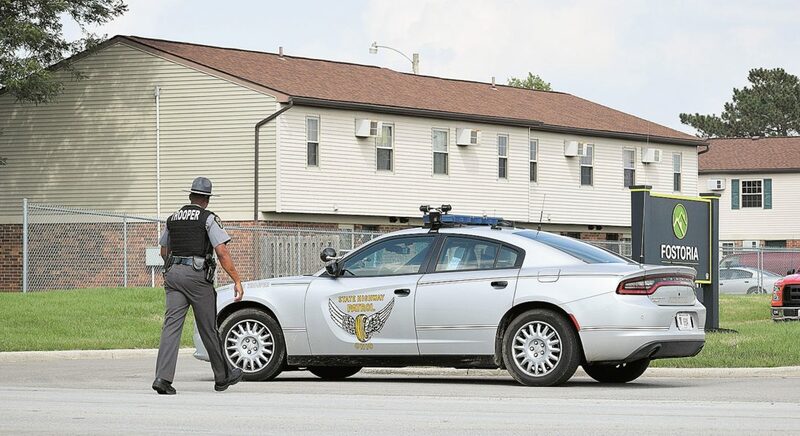 PHOTO BY JILL GOSCHE Trooper Donte' Hanns of the Fremont post of State Highway Patrol walks toward his cruiser near Fostoria Townhomes, 1203 Peeler Drive, Monday afternoon. FOSTORIA — Law enforcement officers responded to a report of a man with a gun threatening a woman and being barricaded inside an apartment in Fostoria Monday afternoon. The incident was at Fostoria Townhomes, 1203 Peeler Drive. Personnel from Fostoria Police Department, Fostoria Fire Division, Hancock County Sheriff’s Office, Seneca County Sheriff’s Office and State Highway Patrol responded. Deputy Troy Callahan of Seneca County Sheriff’s Office said all the apartments in the building had been searched, and officers then were given information that the man had left prior to their arrival. Fostoria’s special response team made entry, he said. Further information was unavailable from Fostoria’s police chief Monday.